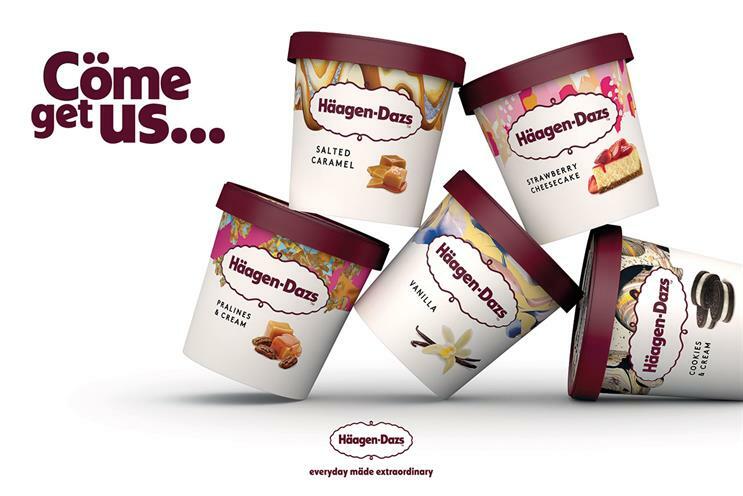 Häagen-Dazs has failed to evolve since it popularised "luxury" ice-cream in the 1990s, its top marketer has admitted, as owner General Mills carries out a revamp of the brand. The update involves refreshed packaging - created by Manchester-based Love - new product formats, an experiential campaign with culinary artists Bompas & Parr and a TV campaign created by Saatchi & Saatchi launching in June. Arjoon Bose, UK and northern Europe marketing lead, said Häagen-Dazs wants to move away from the "over-aspirational" luxury cues it has used in the past. The new packaging dispenses with the previous gold and black colour scheme, opting for a stronger use of burgundy and a more contemporary graphics style. Instead of the kind of glamorous advertising that Bose said was best exemplified by "The house of Häagen-Dazs" starring Bradley Cooper in 2013, the new campaign will consist of vignettes around the theme of "everyday made extraordinary". "We were this very disruptive cultural icon, and we haven’t necessarily evolved with the times," Bose said. "We’re trying to re-anchor ourselves in the culture and be iconic again." Brands must now portray luxury as something within reach, he said: "We want to move away from brands sitting in an ivory tower – luxury brands are about real and authentic experiences."